The agreement with the supermarket chain includes exclusive naming rights and other partnership benefits, including prominent interior and exterior Hy-Vee signage throughout the arena as well as state-of-the-art video board logo placement. Drew Holmes, Hy-Vee’s senior regional vice president of the Kansas City market/southwest region, said the company’s exceptional customer service extends beyond the aisles of the grocery store. Historic Kemper Arena was constructed 1973–1974 on the site of the former Kansas City Stockyards just west of downtown in the West Bottoms. The building was revolutionary at the time in its simplicity and the fact it did not have interior columns obstructing views. In 2016, it was listed on the National Register of Historic Places. The building is currently undergoing a $39 million renovation by Foutch Architecture and Development. 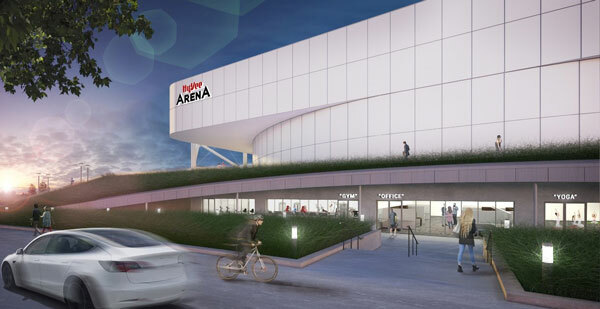 Upon opening in September, Hy-Vee Arena will be the first-of-its-kind, state-of-the-art sports environment and hub for hundreds of local, regional and national tournaments each year. The arena design includes the addition of a second floor providing over 84,000 square feet of sports and event space. In addition to the two floors of column-free hardwood floors, one of the largest indoor tracks in the United States, measuring 350 meters, will be perched over the new 52,000-square-foot second floor. Specialty businesses within the facility will include speed and agility training, cross-fit, a fitness gym, hydrotherapy, golf simulators, e-gaming, dining, retail and commercial offices. No other venue in the country will provide what Hy-Vee Arena will have under one roof, making this facility the premier location for indoor sports. Hy-Vee, Inc. is an employee-owned corporation operating 245 retail stores across eight Midwestern states with sales of $10 billion annually. The supermarket chain is synonymous with quality, variety, convenience, healthy lifestyles, culinary expertise and superior customer service. Hy-Vee ranks in the Top 10 Most Trusted Brands and has been named one of America’s Top 5 favorite grocery stores. The company’s more than 80,000 employees provide “A Helpful Smile in Every Aisle” to customers every day. For more information, visit www.hy-vee.com. Foutch Architecture and Development, LLC., is a privately-owned company headquartered in Kansas City, Missouri. The architecture and development company is known for its ingenuity and one-stop-shop approach since 2004 and has developed over $300 million of historic and tax credit related properties. The arena is the company’s largest sports project to date.